Cord Lamp shows the cord that is normally meant to be hidden in a funny way; here it has been transformed into the own structure of the floor lamp. All superfluous details have been eliminated in order to focus on the essential. The visual result is stunning: the retro-styled cord seems literary to be fluttering in the air, as if by magic! Hint: the rigidity is guaranteed by steel wire structure covered in black and white striped fabric. 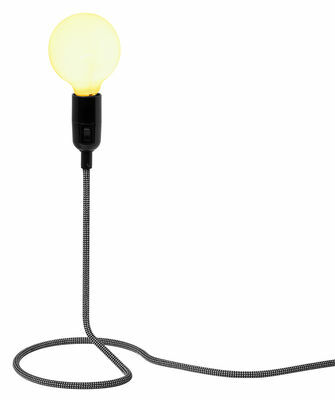 Cord Lamp is simple, modern, stunning... Supplied with a transparent bulb (60W). “Form us with Love” is a Swedish design studio, creator of furniture and lighting for several big internationally recognised companies. They have been awarded “Red Dot design award” and “Young Swedish design award”.